Some anglers go to worlds end to search out the fastest, most fierce fish they can throw a fly at…some need only to walk out their backdoor and down to the dock to do battle. For the angler looking for a reel that is as adventurous and dependable as they are, look no further than the NEW Atoll Reel Series. Precision machined from Cold- forged 6061-T6 billet aluminum and hard anodized to a clear satin finish, Atoll reels are as tough as they are handsome. 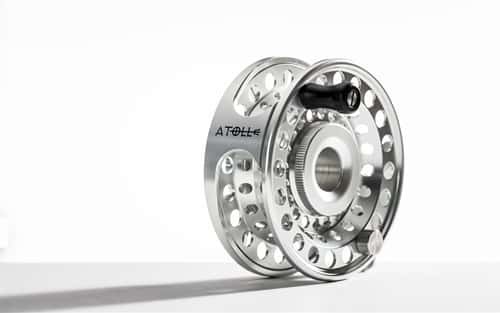 The revolutionary and unique “hubless” design of the Atoll moves the stacked delrin/stainless steel drag system away from the center mass of the reel. What does this all mean? More efficient stopping power and greater heat dissipation, as the drag contact area is spread out over a larger surface area.